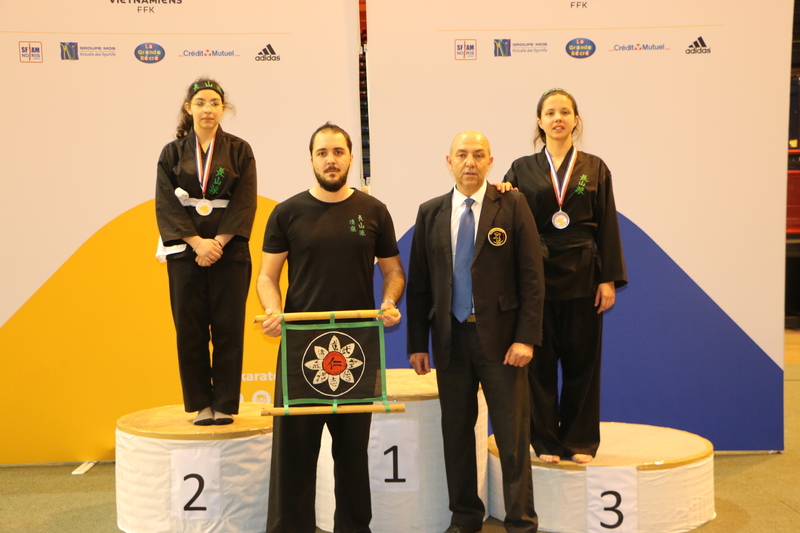 The France Championship of Vietnamese Traditional Martial Arts Viet Vo Dao took place at the Carpentier Hall in Paris on Saturday 16 and Sunday 17 March 2019. 300 competitors competed during these 2 days of competition. Jade Poublanc finished second place on the podium with a silver medal in the female junior category +55 kg – thanks to her spirit of dedication. Nina Delagrange also finished on the podium at the third place equivalent to the bronze medal in the senior category. Despite physical preparation, she was injured by the nose from her first fights and had a bleeding that was difficult to control. That made her change the fighting strategy. She kept her opponents at a distance avoiding face-to-face contact as much as possible. She finished at the honourable third place with panache. Viet Vo Dao Thanh Long Île de Ré once again scored a double in this competition with the 2 participants. The next competition will be on the 29th and 30th of March for the French technical championship which will take place in Clermont Ferrand where Nina and Jade will again represent Île de Ré club. Upcoming events include the French children’s cup on the 18th and 19th of May in Paris and the French Thanh Long cup in Clermont Ferrand on 8 and 9 June 2019.
or visit the Photo Gallery.